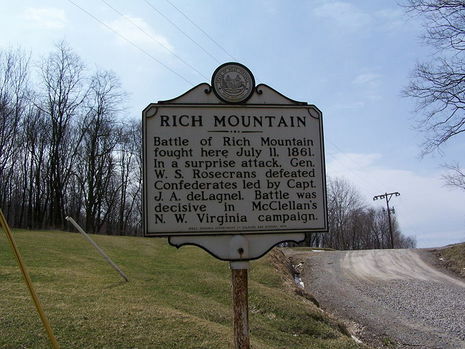 The Battle of Rich Mountain took place on July 11, 1861, in Randolph County, Virginia (now West Virginia) as part of the Operations in Western Virginia Campaign during the American Civil War. Maj. Gen. George B. McClellan assumed command of Union forces in western Virginia in June 1861. On June 27, he moved his divisions from Clarksburg south against Lt. Col. John Pegram's Confederates, reaching the vicinity of Rich Mountain on July 9. Meanwhile, Brig. Gen. Thomas A. Morris's Union brigade marched from Philippi to confront Brig. Gen. Robert S. Garnett's command at Laurel Hill. On July 11, Brig. Gen. William S. Rosecrans led a reinforced brigade by a mountain path to seize the Staunton-Parkersburg Turnpike in Pegram's rear. A sharp two-hour fight ensued in which the Confederates were split in two. 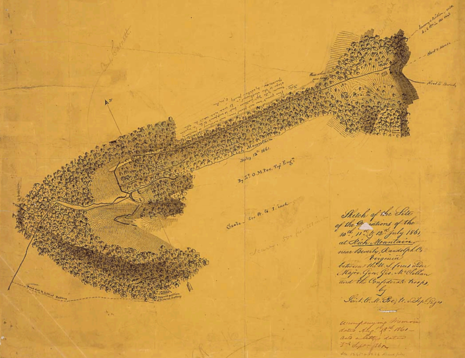 Half escaped to Beverly and on over the Shawnee Trail, but Pegram and the others (including the "Sydney Boys", a regiment formed from the students of Hampden-Sydney College) surrendered on July 13. Hearing of Pegram's defeat, Garnett abandoned Laurel Hill. The Federals pursued, and, during fighting at Corrick's Ford on July 13, Garnett was killed; he was the first general officer to be killed in the war. On July 22, McClellan was ordered to Washington, and Rosecrans assumed command of Union forces in western Virginia. The Union victory at Rich Mountain was instrumental in propelling McClellan to command of the Army of the Potomac. Following their hasty retreat from Philippi in June of 1861, Confederate troops under the command of Col. Robert S. Garnett fortified two key passes. The more southerly of these, Camp Garnett, consisted of earth and log entrenchments overlooking the Staunton-Parkersburg Turnpike at Rich Mountain, just west of Beverly. Major General George B. McClellan, charged with securing the loyal counties of western Virginia and protecting the area's vital B & O railroad for the Union, brought over 5000 troops and 8 cannons to Roaring Creek Flats, about 2 miles west of the Camp Garnett entrenchments. Confederate Lt. Col. John Pegram was in command of Camp Garnett with about 1,300 men and 4 cannons. He sent a small party to protect his rear at the Joseph Hart homestead at the pass where the Pike crossed the summit of Rich Mountain. On the morning of July 11, the force at the pass consisted of 310 men and one cannon.